Donald Trump rescinded the Golden State Warriors' invitation to the White House after Stephen Curry said he didn't want to take part in the visit. Donald Trump rescinded the Golden State Warriors’ invitation to the White House after Stephen Curry said he didn’t want to take part in the traditional post-championship Oval Office visit. Trump’s tweet came just days after the Warriors said they’d hold a training camp meeting to decide, as a group, whether to visit the White House. Warriors coach Steve Kerr, NBA Finals MVP Kevin Durant, Andre Iguodala and Draymond Green each previously expressed reluctance about visiting Trump’s White House following their 2017 NBA Championship win. In the past few weeks, Trump has taken repeated aim at black athletes and sports personalities, with NFL quarterback Colin Kaepernick and ESPN host Jemele Hill among the targets. “Hey @StephenCurry30, welcome to the club bro,” Hill tweeted Saturday morning. In addition to now beefing with two of the NBA’s most popular players, Trump also ignited a feud with the entire NFL during an Alabama rally Friday by suggesting that football is too soft now and saying that players who stage National Anthem protests should be fired. 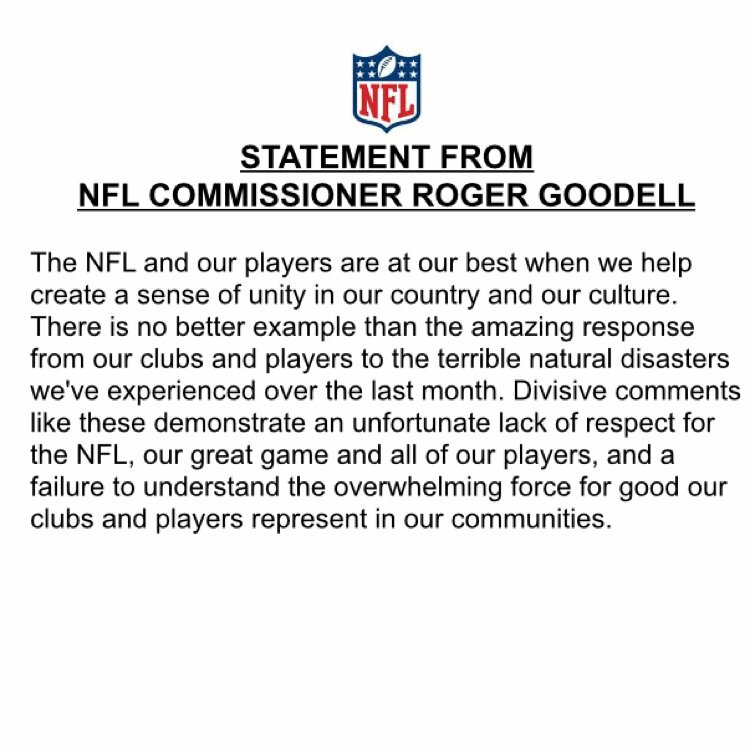 In an unexpected move, the NFL released a statement criticizing Trump’s “lack of respect,” while numerous NFL players turned to social media to slam the president.